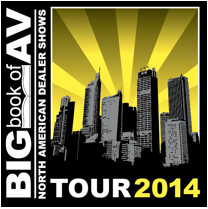 The Spring 2014 Stampede Big Book of AV (BBOAV) Tour will roll into Montreal, Canada on February 20th, where AV industry dealers and manufacturers will showcase their solutions at the Sheraton Montreal Airport hotel. “Each stop on the 2014 tour features a mix of product demonstration, business building idea sessions, networking opportunities — and a few surprises,” said Stampede Presentation Products Inc. President & COO Kevin Kelly. The Montreal stop will feature a presentation by Epson’s Judy Burns on the present and future of 3LCD technology. Burns has previously represented brands such as InFocus and Proxima. According to Kelly, BBOAV Tour attendees will learn how they can begin profiting from the new era of The Internet of Things (IOT). To further address the “Internet of Things”, the Montreal stop will feature a designated area for IOT manufacturers, identified by pop-up banners and stands. Additionally, each session will earn attendees .5 CTS RU Credit. Stampede will be offering event incentives such as $500 Stampede credit, a $100 Restaurant.com gift card and a $50 gift card for attending the BBOAV Tour. Every attendee will also be entered into a drawing to win a 42” LG LCD HD television. Beyond Montreal, many stops will allow attendees to participate in the International Technology Retail Association (ITRA) Annual Member Meeting and the regional Infocomm Roundtable Meeting that offers the opportunity for additional networking and CTS certified training.